Easy food changes to go vegan in 2015! As I walk through the grocery store aisles, I see vegan cheese puffs and cookies and all kinds of delights! I can make lattes with frothy creamers and create a compassionate, cholesterol-free chicken salad. This is truly a time when it really is easy to start eating vegan. 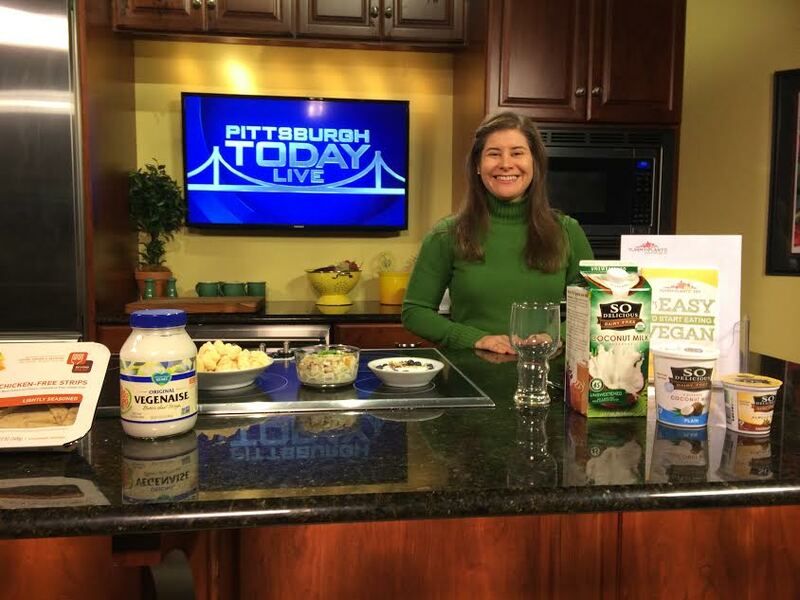 I was very excited to be back on Pittsburgh Today Live to share ideas about cholesterol-free eating in the new year. The good news is that ALL plant-based foods are cholesterol-free. I brought in some of my favorite products to sample and share. I wanted to demonstrate how to make easy, delicious changes that are better for our health, for our planet, and definitely better for the animals. First and foremost – these products are delicious! The Today Show hosts taste tested and couldn’t tell the difference! Plant-based protein with soy-based and soy-free alternatives. Innovation: delicious, healthy new products keep appearing like the new vegan Beast Burger! Sugar: Skim dairy milk has about 12g of sugar vs. less than 1 g in unsweetened coconut milk. Cholesterol: Skim dairy milk has about 12g of cholesterol vs. ZERO g in coconut milk. Calories: Skim dairy milk has about 103 calories vs 45 in coconut milk. Continuing on with dairy, we discussed vegan butter by Earth Balance. I always talk about Earth Balance buttery spread with new vegans. Why? It tastes DELICIOUS – plain on bread or in cookies/ sauces. It works well as a 1-1 substitute for cooking and baking. Their palm oil is certified sustainably sourced, so my purchase and lifestyle choices are supporting a safe habitat for the orangutans. Earth Balance buttery spread, and all of their products, are free from casein. (Some dairy-free butter substitutes do contain casein, which for me causes an inflammatory response and joint pain). There are so many delicious plant-based foods out there. If you’ve been thinking about going vegan, now is a great time to start. Pick up a copy of It’s Easy to Start Eating Vegan or browse the Yummy Plants database for ideas. You’re not alone. You do have support. If you have any questions, ask the Yummy Plants community and post questions on our Facebook page. I wish you a fabulous journey!